Attractive, no? Yes, I am wearing a boot (air cast). I have tendonitis in my right foot/ankle. As if chasing a 10 month old around this house wasn't challenging enough. Now I have to do it with this big ole thing on my foot. It is really uncomfortable and I'm thinking it is making my pain worse not better. 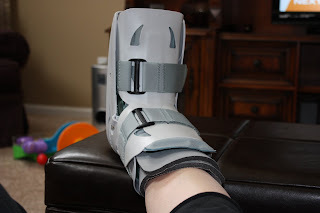 But, I have strict orders to wear this for 3 weeks and to stay off my feet as much as possible. Yeah, right. I can take it off to sleep and that's pretty much it. Lovely. No working out either. Apparently my foot doesn't know that I need to get into a bathing suit in 2 months. I'm so excited for our trip to Mexico and finally had something that really motivated me to actually want to work out. Now I can't. I'm still going to do what I can. Some sit ups, arm weights, etc. but all I can say is that this BLOWS! I guess it is better than the Dr.'s first suggestion which was a regular cast. I laughed in his face. This was option #2. I have no idea how/why I got this. He said it could be due to me starting a regular workout schedule after not working out while I was pregnant and then he spouted off something about hormones. I'll show you hormones buddy! So now I am kicking myself for not working out while I was pregnant. I tried but the pinched nerve in my back had other ideas. Well that, and the first four months of all day nausea that prevented me from doing almost everything that I normally do. I love my boot. I love my boot. I love my boot. Nope....saying it over and over doesn't work. I HATE my boot! OH NO! Surprisingly, you are the THIRD person I know this month who has had to strap one of those on! What is going on??? Ok, hormones?? I've never heard of that. Not that I'm a doctor and all, but that sounds like a weird explanation. 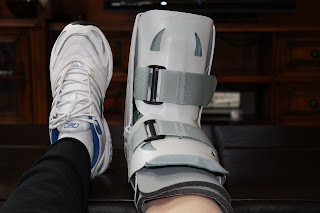 Hope the next 3 weeks aren't horrible and you're able to get used to that boot. Maybe you can jazz it up with some color? A bow? Jewels? Puffy paint? No? Hmmm... well grey is the new black. That's a real bummer. Can you swim? What the hell is that! Jenn - you poor thing! I am so sorry you have tendonitis, that just sounds painful and 3 weeks is a long time. Booo! I hope your ankle feels better after all this! so sorry for your tendonitis. that is tough. my sister broke her big toe a while back and was completely miserable that she could not wear any cute shoes. we have new respect for feet issues! and have i mentioned how much i love your header pic? well i do!